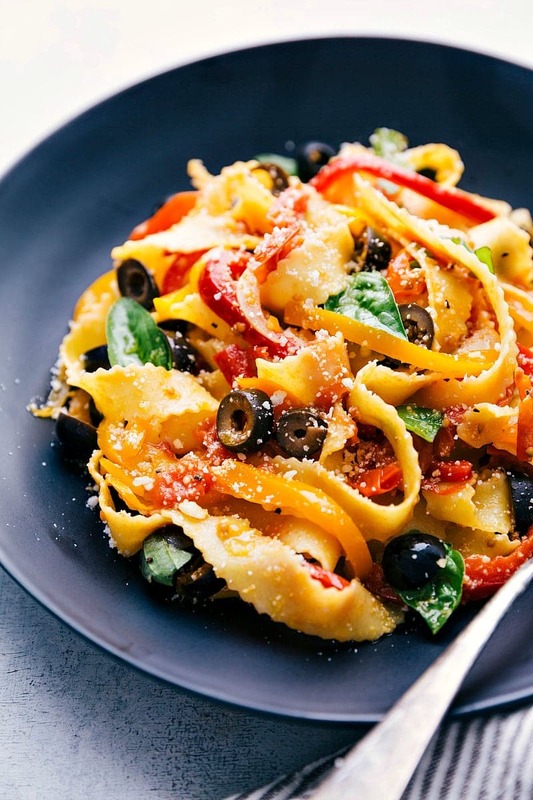 An Italian savory bell pepper and tomato sauce with olives over pasta with Pecorino Romano PDO and fresh herbs. This Pepperoni Saporiti has few ingredients and the method is simple, but the flavors in this final dish will blow you away! My kids (luckily) LOVE snacking on raw veggies. As long as they have something to dip them in, they could eat them all day long! While not all veggies are equally popular, carrots and bell peppers are consistently gone first. And I’ll admit, those are the first two I’ll go for too. So when we were in Italy this past summer and I saw a pasta dish topped with a bell pepper sauce, you can bet that was the first thing I wanted to try! Sure enough it did not disappoint. And since getting some tips from the very chef in Italy, I’ve tweaked it a bit to create my own version which is a big hit at our home! 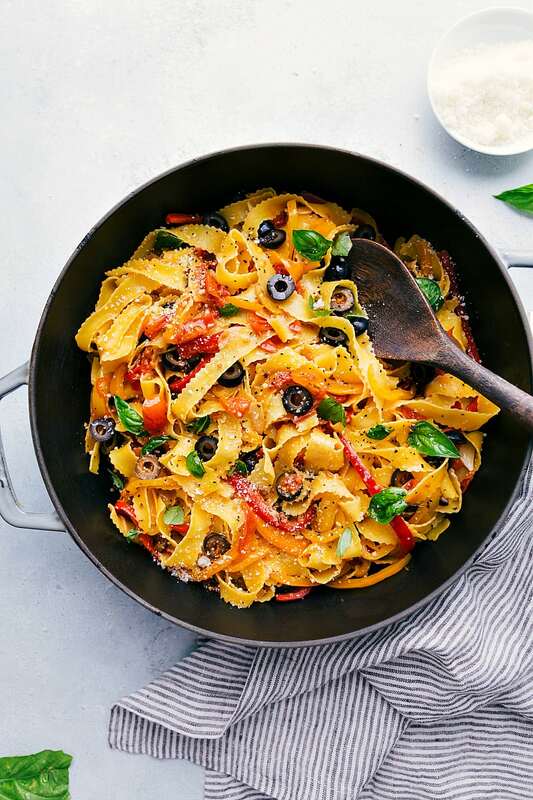 To make a savory bell pepper sauce, you’ll start by infusing the Toscano PGI Extra Virgin Olive Oil with garlic, a chili pepper, and fresh herbs. This will create a delicious base for the sauce to begin! 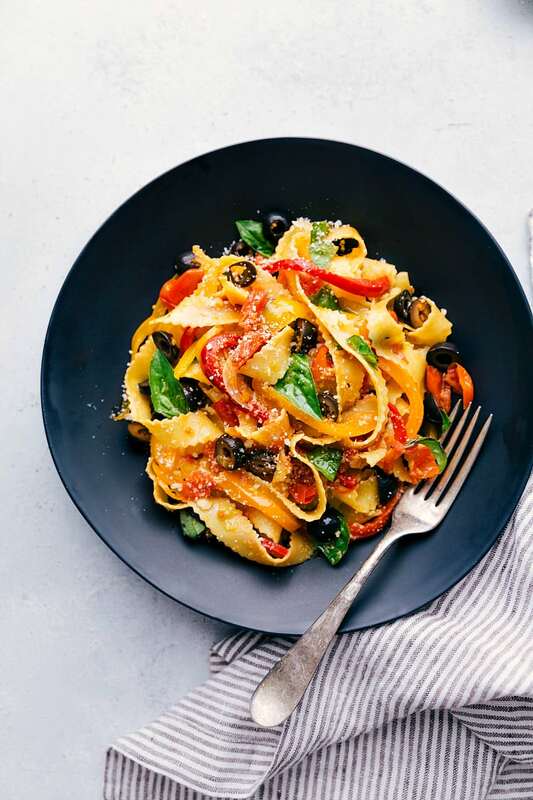 The Toscano PGI Extra Virgin Olive Oil is an authentic Italian Olive Oil and you’ll definitely notice a huge flavor difference in this recipe by using that oil. Since the sauce is primarily veggie based, you need a really flavorful oil to make the perfect sauce. After the oil is nice and infused, you’ll add in three thinly sliced peppers, a pint of tomatoes, and some sliced olives. This will simmer over medium-low heat for 35-45 minutes with an occasional stir. 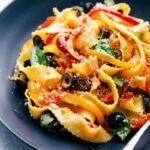 The peppers get super soft and tender, the tomatoes form a thick sauce, and the olives continue to infuse the sauce with flavor. While the sauce is simmering you can cook the pasta making sure to reserve some of the cooking liquid for the finishing touches on the bell pepper sauce. Toss the cooked pasta with the sauce, add in reserved pasta water as needed, and top with plenty of Pecorino Romano PDO and fresh basil! The Pecorino Romano PDO is the perfect finishing touch for this pasta dish. It gives it a nice salty and intense finishing flavor which really balances out the heat from the chili. This dish just wouldn’t be the same without the Pecorino Romano PDO! For this Pepperoni Saporiti, I’m using Toscano PGI Extra Virgin Olive Oil for the beginnings of the sauce and to top the final pasta dish. You’ll definitely notice how much more flavorful your sauce will become with an authentic Italian extra virgin olive oil! In so many Italian dishes there are relatively so few ingredients and those ingredients definitely matter. I’m also using Pecorino Romano PDO which is a hard, salty Italian cheese made out of sheep’s milk. This cheese is spicy, intense, and fragrant and makes all the difference in this dish! It really is the ingredient that ties everything together! Can I change out the fresh herbs in this Pepperoni Saporiti for winter? Yes! In the winter, you can use fresh winter bay leaves in place of the fresh basil. An Italian savory bell pepper and tomato sauce with olives over pasta with freshly grated pecorino cheese and fresh herbs. This Pepperoni Saporiti has few ingredients and the method is simple, but the flavors in this final dish will blow you away! In a very large nonstick skillet (large enough to hold all the cooked pasta later on), add the olive oil. Heat over medium low heat. Add in the thinly sliced garlic cloves, chopped red chili pepper (or flakes) and sprigs of fresh basil. Fry over medium-low heat to release the aromas. Meanwhile, cut the bell pepper into thin slices, halve the cherry tomatoes, and slice the olives. Place the peppers, tomatoes, and olives in the skillet and cook over medium heat until the peppers are tender, stirring occasionally. This takes about 30-35 minutes. Meanwhile, cook the pasta according to package directions making sure to RESERVE 1/2 cup of the pasta cooking water. Add the drained hot pasta to the sauce and toss vigorously to coat. Add the reserved pasta water as needed to help the sauce. Add a few drizzles of additional olive oil, season with salt and pepper as desired (remembering olives and cheese are salty), and serve hot with cheese on top. *Increase or decrease the heat of this dish with the quantity of red pepper flakes (or chili pepper) 1/4 teaspoon is quite mild and 1/2 teaspoon is spicier. **Can use Piennolo del Vesuvio Tomatoes PDO or San Marzano dell'Agro Sarnese-Nocerino Tomatoes PDO in place of cherry tomatoes. Looks like a tasty recipe! I love how the colors look like the Italian flag 🙂 I’m currently reading your book and it is wonderful, full of terrific information! Such a great recipe with a great presentation. Presenting food is such a difficult and you did a wonderful job. Your site is amazing with tons of good stuff.